Currently for sale on ebay starting from 1p with no reserve. The first of these little postcard sized paintings that I have done for a while. It feels quite odd going from painting huge works like 'In Passing' to something this tiny, my eyes take a while to adjust! 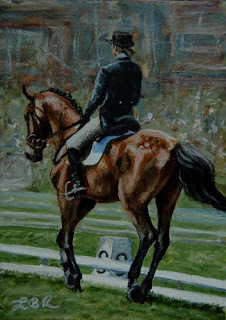 This one is based on photographs I took at Bramham Horse Trials last year. Not often I attempt a full background with these tiny paintings but I fancied a challenge and this one was definitely that! Just for fun I made this video... shame it is so dark what with the dark dreary British weather but you get the idea! It's not intended to be in any way educational I hasten to add, plenty didn't go to plan (including lifting off a whole detailed layer that wasn't dry enough before I painted over!) but I'm pleased with the finished painting and find it weirdly interesting to watch haha! 'In Passing' finished, for now. Pretty much finished now! I am a bit bored of it now so have signed it and will go back in a few months with fresh eyes so tidy it up and correct anything that needs it. It is impossible to photograph mainly because of it's size I think, so I'm looking forward to getting it properly scanned. The colours aren't very true in this image, and the canvas is badly warped so some of his back is missing! Really enjoyed painting this, and have learnt a lot that I hope will help with the next big one. Managed to get a photo of this one after all! 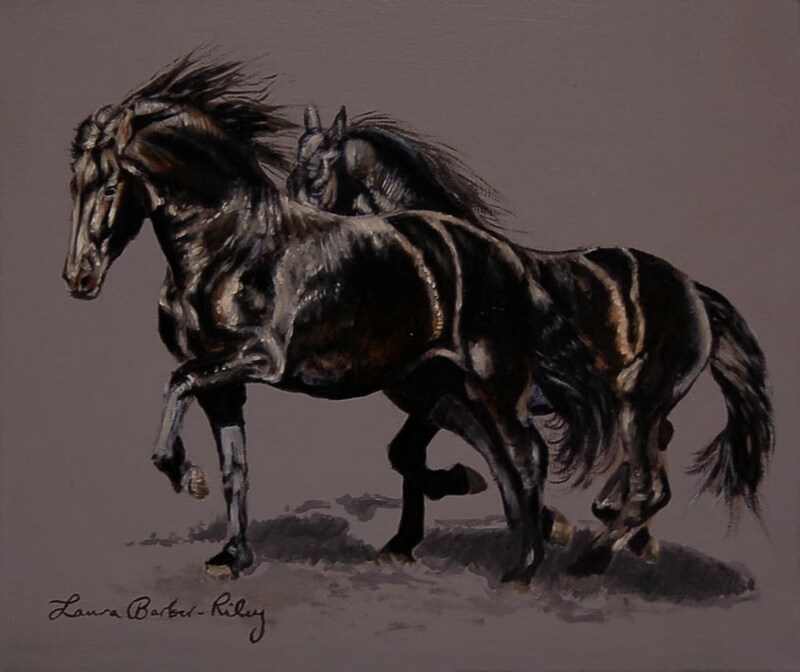 One of those paintings that just painted itself really! My husband doesn't like the title 'In Passing' but I quite like it and can't think of anything better! Not a million miles away from finishing now. Haven't even really started the hooves or the shadow so they need some work but the bulk of the horse is done bar a few tiny finishing touches. 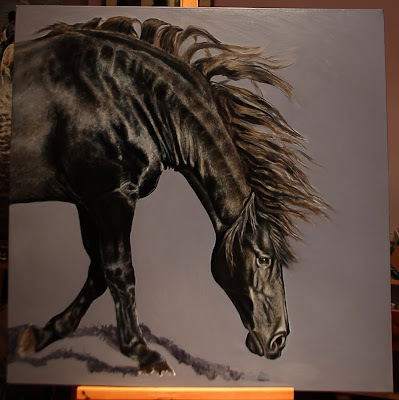 Spent a lot of time on the mane today and I'm quite pleased with it; it doesn't translate well on camera though! 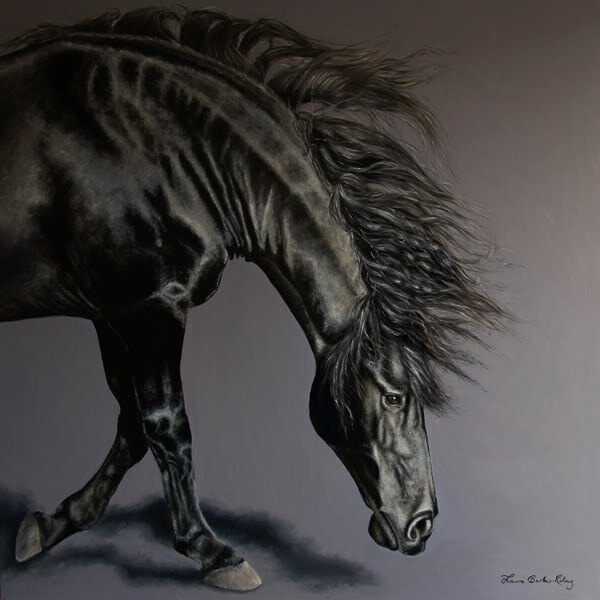 Finished another little Friesian painting today too but couldn't get a decent photo of it, will have to try again tomorrow. Everything has pretty much ground to a halt here after I had pretty big abdominal surgery last week- not fun! 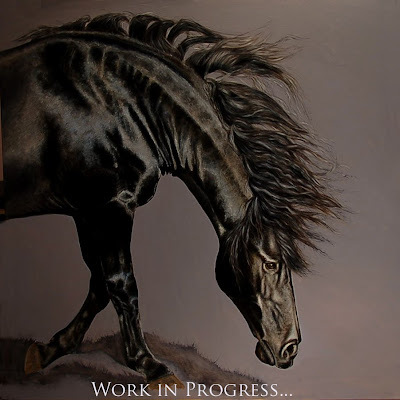 Felt well enough to do some more on the large Friesian yesterday so above is an update. Still much to do, the mane is a layer behind the rest, and I need to make a start on the hooves and shadows too. As usual I am really struggling with a title... maybe 'In Passing'? My recovery is expected to be quite long (not easy with 2 children under 3!) but sitting at an easel is a fairly quiet activity so while my husband is off work looking after me I might actually be more productive than I expected! No commissions on the go though; it's nice to pick up a paintbrush when I fancy and I'm not sure my concentration levels are up to the careful scrutiny needed to do someone else's precious horse justice yet!